So you want to be more intentional about the experiences you're creating for your learners. That's great! But where do you start? There are six simple questions to ask yourself as you're getting started, and chances are, you've already got a lot of practice in answering many of them. The real trick is to train yourself to consider and answer them each with equal emphasis and in order. By the time you're done, you'll have all the components of a cohesive learning experience ready to go. 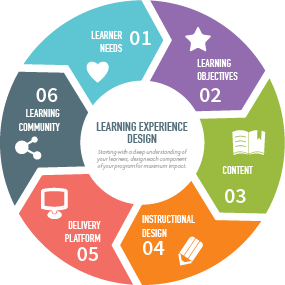 At Open Classroom Consulting, we envision six phases of learning experience design. 01 - Who are your learners, really? Start with understanding your learner's needs. Who are you trying to reach with this learning experience? What do you know about your learners? Consider not just what they already know about your subject area but also who they are, where they come from, and how they choose to spend their time outside of your classroom. In Design Thinking, we call this step "developing empathy," because it's all about walking a mile in your audience's shoes. 02 - What are you trying to teach? Defining learning objectives is second nature to most teachers; we dream in SWBATs. But to be more intentional about your LOs, think about how you can define discrete, measurable objectives through the lens of what you know about your learners, not just what you think they should be able to grasp in the time you have. 03 - What content will engage and delight your learners? There is more than one way to skin a cat, and often, there is more than one choice when it comes to which content your learners will best respond to. If you always teach a particular novel or a specific problem set in Calculus, is there a way to switch things up and find content that might better reach your audience? 04 - How will you structure the learning? Here's where Instructional Design comes in. Create lesson plans, assessments, and curriculum to your heart's content. Consider pedagogical approaches and frameworks here, too. 05 - Where will the learning take place? Will this experience take place face-to-face or online? Synchronously or asynchronously? How much intentionality can you bring to the design of the classroom or online tool in order to support your learners? 06 - How will learners interact with one another and with you? The community in which learning takes place can be extremely powerful, especially for learners who thrive on collaboration and interaction. Consider how you can create community, or how you will leverage an existing community to help your learners succeed. When approaching a learning design, take time to explore your responses to each question, building your design as you go. If you start with the needs of your learners and weave that understanding throughout the design of the rest of the components, it will be easier to weave all the pieces together into a coherent experience. Want to learn more about how to apply Experience Design to your work? Subscribe to our newsletter.